Escape with Knight Errant -- new series now on sale! The issue finds Kerra working — as ever — undercover in Sith space, but never has she had to go further to assume the role. She's invading Odion's territory in a story that includes repercussions from past comics stories and the novel. I'll have some notes on the issue up soon. In the meantime, enjoy the issue and let me know what you thought! The week before a new series release is always a busy one — and I'm particularly jazzed about this one. I just got my advance copies of Star Wars: Knight Errant - Escape #1 from the publisher, and I'm really pleased with how it turned out. The issue releases on Wednesday, but in the meantime, there are quite a few places where you can find out more about it. First off, we have a new "Making of the Cover" piece -- Mike Hawthorne's variant, which is available colored at shops an in black-and-white as Diamond's special edition for San Diego -- on Dark Horse's site here. Then I have a podcast about both Knight Errant and Lost Tribe of the Sith: The Collected Stories and Lost Tribe of the Sith - Spiral at Random House's Suvudu site. Finally, there's a wide-ranging one that also includes exclusive previews of the covers of Knight Errant: Escape #4 and Lost Tribe of the Sith: Spiral #2 at Multiversity. 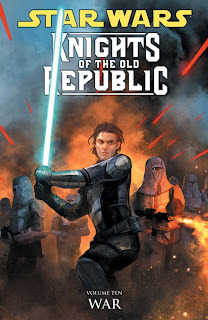 We also get to see the cover for the Knights of the Old Republic - War trade paperback — which releases in December and will be Volume 10 of the ongoing series. It can be preordered now from Amazon and will be in your comics retailer's catalog later this year. I also talk a bit in both podcasts about my longtime work on The Comics Chronicles. It's an exciting time to be in comics — May's sales set a record for the industry this century. Every year, Diamond Comic Distributors works with publishers to create some special editions available to the retailers who'll be setting up at Comic-Con International: San Diego — and this year, the Dark Horse variant will be none other than Star Wars: Knight Errant - Escape #1. The preview is now online for the regular version of the issue, which ships next Wednesday and can be ordered here — but the black-and-white Diamond edition (drawn by Mike Hawthorne) only becomes available in San Diego. (Retailers obtaining them there may well make them available in their local areas, and copies not sold by Diamond there will likely be available for retailers to order.) The issue is limited to 2,000 copies, and I will be signing a few cases of them in advance for Diamond — and then, of course, I will be at the convention myself (airlines willing) to sign as well. Another interview on Knight Errant coming up before the issue releases; I'll post the link when I get it. Follow me on Twitter for regular updates.